Bill Nye the Science Guy, who originated his iconic public TV show in 1994 at KCTS in Seattle, is returning to the public airwaves — as well as theaters nationwide. PBS has acquired North American distribution rights for the documentary Bill Nye: Science Guy, which has its broadcast premiere next year on POV after a theatrical release. Nye, former public TV “Science Guy,” is now a science-education activist and subject of a documentary to air on POV. 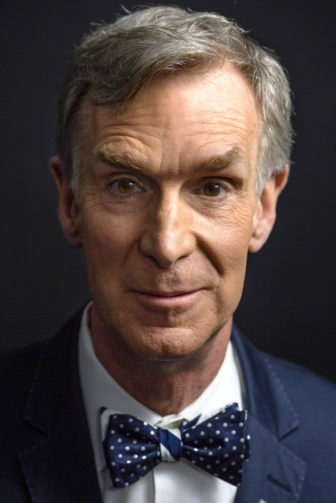 Now, instead of a bow-tied nerd with the catchphrase “Science rules!,” Nye is a science-education advocate and champion for climate science. “He is taking off The Science Guy costume and taking on those who deny the importance of science, with the goal of creating a more scientifically literate and engaged universe,” according to an announcement Wednesday from POV. Filmmakers David Alvarado and Jason Sussberg said in the announcement that they “grew up as middle schoolers watching Bill Nye on PBS, and we’re science filmmakers in no small part due to The Science Guy.” Their crew had “intimate and exclusive access” to follow Nye, now CEO of the Planetary Society, a nonprofit research, outreach and advocacy organization for engineering related to astronomy, space exploration and planetary science. Other science luminaries in the film include astrophysicist Neil deGrasse Tyson and science writer Ann Druyan, wife of Carl Sagan (Cosmos). Nye’s message on the importance of science education “is as relevant today as when his show debuted on PBS nearly 25 years ago,” said Marie Nelson, PBS VP of news and independent film. “Now, as Bill Nye has focused on his role as a champion for climate science, we hope his story and this film will spark dialogue across ideological lines,” said Justine Nagan, POV executive director/executive producer. The original Bill Nye the Science Guy was the first program to run simultaneously on public and commercial television. PBS Distribution will release the film in theaters later this year following festival screenings at AFI Docs in Washington, D.C., and the Los Angeles Film Festival. The documentary premiered at the South by Southwest Film Festival in March. “It seemed time for filmmakers to have a safety net,” said Executive Director Justine Nagan.